Minister of Foreign Affairs of the Czech Republic, Mr. Karel Schwarzenberg presented to teh Centipede the award "Gratias Agit 2007"
Since 1997, Minister of Foreign Affairs of the Czech Republic awards with the award Gratias Agit the dedicated people from all over the world who promote the Czech Republic abroad with their wonderful work. Among the laureates of this award are Czech countrymen from different parts of the world who still count themselves to Czech citizens and friends of the Czech Republic who volunteer to promote our country – interpreters, scientists, artists, educationists. The award was handed over to foreign and Czech non-governmental organizations as well. 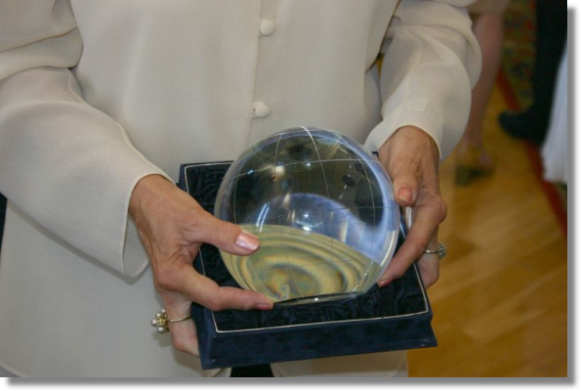 On June 19, 2007, Minister of Foreign Affairs of the Czech Republic, Mr. Karel Schwarzenberg presented the Gratias Agit award to the movement „On own Feet“ – Centipede. The festive ceremony took place in Cernín Palace at the Ministry of Foreign Affairs in Prague. Except Mrs. Bìla, also children from the school Kladská in Prague, elementary school Dolni Bukovsko and 20th elementary school in Plzen, vice-consul of the Norwegian Embassy in Prague Ms. Laila Kind Ronholm, vice-president of the movement Ms. Astrid Hagen Huerta, Gen. Josef Proks, Col. Jan Gireth, Lt. Col. Petr Milcicky, Mr. Petr Rehor, Dr. Ivana Hodkova, Mgr.Katka Vavrova, Mgr. Helena Kovarikova, Mgr. Ilona Jehlickova, Mgr. Helena Dufkova, Mgr. Jiri Seffl, Ing. Jana Flanderova and Ing. Lubomir Dufek were present. The importance of the award can be seen also while reading the list of the awarded people – among them His Royal Highness Norodom Sihamoni, the King of Cambodia, film director Milos Forman, former minister of foreign affairs of the USA Ms. Madeleine Albright, interpreter, former senator and ambassador Ms. Jaroslava Moserova, Czech businessman Tomas Bata jr., skier Katerina Neumannova and many others. Presenting the Gratias Agit award to the movement „On Own Feet“ is a huge honour and appreciation of the work of all the children, their teachers and friends not only in the Czech Republic, but in Norway, Slovakia and other countries where the ideas of Centipede started to grow – all adults and children who tried and try to ease the life of the children in countries that were affected by war and other disasters. It is also an award for all soldiers who help to realize Centipede’s projects.